Vacon is the world's largest growing AC drives manufacturer. Vacon drives are flexible, easy to use, reliable, robust backed with world-class global service support. Vacon’s philosophy in manufacturing of AC drives is: “Drives should be tailored to customer’s demand and not vice versa”. This philosophy has lead Vacon to offer its customers: all series of drives with in-built PLC; all series of drives with in-built AC chokes; economical IP54 versions; through hole mounting facility. 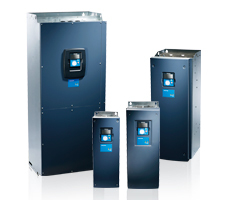 Vacon drive saves energy more than 20-25% in humidification system; eliminates external humidification controllers; saves extra cost; user friendly and application oriented VFD HMI; ambient temperature 50º ambient; Ib-built AC chokes protect drive input rectifier against voltage spikes & surges; 100% reliability on single system as no external controller is used; no extra spare parts inventory for external controller. If you are looking for Vacon Drives, please contact us.We will do our best to help you find the Vacon series Servo Drives that you are looking for at the most competitive prices possible. our sales representatives can provide you with a pricing and availability quote for Vacon drives. If you do not have the part numbers for Vacon drives, our application engineers will be able to help you find out the part numbers and get the offer to you ASAP.